If you’re thinking of leaving the UK to begin your own American dream, you’ve come to the right place. We’ve spoken to a wide variety of experts, from realtors to currency specialists, and created this helpful guide, which will tell you all you need to know about buying property in the States. 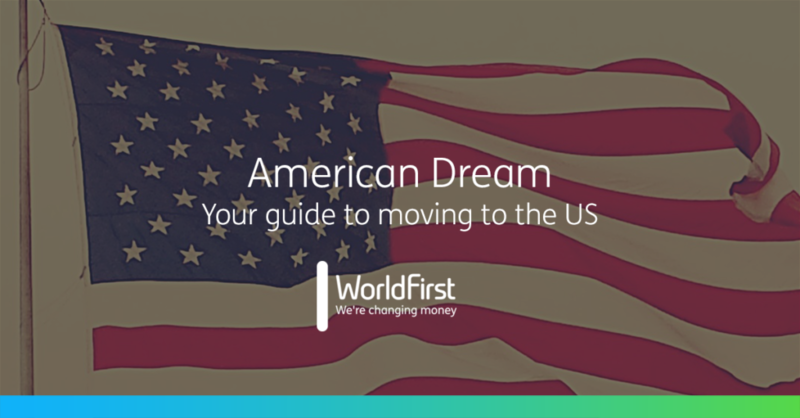 Whether you’re moving to sunny Florida or historic Washington DC, World First is here to lend a hand. Let’s get started with your guide to moving abroad. As you may be aware, the tax system in the US is completely different to the one you’re used to in the UK or elsewhere. Adam Smith, tax expert and partner at Westleton Drake, explains that the US taxes its citizens based on their worldwide income, not just on what they earn within the country. “You are, however, allowed to offset your US liability by taking a credit for any foreign taxes that you have paid,” he notes. All taxpayers must file an annual tax return, even if no tax is due. How much tax do expats pay when moving to the USA? Naturally, the amount you pay in taxes will differ according to your earnings, but there are two levels of taxation in the US: federal and state/local. “Individuals are subject to graduated tax rates from 10% to 39.6% on their gross income, less certain deductions and exemptions,” explains Smith. On top of this, most states and localities charge tax too, though this tends to be significantly lower. There are around 7 states that don’t charge a local tax, including Florida, Nevada and Texas. This means some states are more expensive to live in than others, so do your research before you move. While there is the strong possibility you could be double-taxed whilst living in the US, there are certain tax credits that can help you out, including child tax credit, some education credits and earned income credit (for low-income earners). Before you can even start thinking about looking at houses overseas, you need to make sure you’re actually able to move to the US. Laura Kijner, a Florida realtor, says those who have successfully migrated to the States have taken their time to do their research. They’ve visited the area they wish to live in and they’ve been patient. Moving to the US is not something you can do in the space of a month. “A lot of people don’t realise that getting the proper visa or even a green card is not an easy task,” Laura notes. It’s all about asking yourself the right questions: do you have everything you need to facilitate your move and make it happen? Do you have a US bank account? Do you have all the necessary funds available for an investment? How about currency conversion? Are you a cash buyer or will you need a loan? Researching the area is key – you need to ensure you and your family will be comfortable living there. If you have kids, you’ll need to check what the local schools are like. Don’t forget the day-to-day stuff too; going to the local store in your neighbourhood could mean hopping in the car and driving for 20 minutes. Can you put up with that if you’re used to walking 5 minutes down the road? The US house-buying process for expats. “Once a property has been identified by the client, a contract for purchase will be formed with purchase price, terms and conditions, and presented by the Buyer’s Agent to the Seller’s Agent. Usually at the offering, a down payment of between 5% and 10% of the purchase amount is given, and held by an escrow agent – a neutral third party – until the offer is accepted. It will be refunded if the offer is declined. As you might expect, cash sales are usually completed sooner, whereas purchases using loans will generally take longer. All real estate agents in the US have access to the same properties within their market, which makes searching for a new home really easy. All US house listings can be found on one centralised website. Click here to start searching today. Realistically, you won’t know what you can afford property-wise until you convert your British pounds, or other currencies into US dollars. Of course, securing the USD best exchange rates available is highly important, as you want to get as many dollars for your pounds as possible. However, exchange rates change all the time – the market is almost impossible to predict. That’s why, when you see a good rate, it’s best to secure it. A specialist currency broker, like World First, can help you do this. What’s more, the fees you’ll pay are typically lower than if you were to transfer your money via your bank instead. “If you’re buying a property in the US and the exchange rate is in your favour right now, but you don’t need to pay the balance for another 3 months, there is a way you can benefit from today’s favourable rates for a payment in 3 months’ time. Using what’s known as a forward contract, you can secure that exchange rate now and know exactly how much you’ll pay for the property when it’s time to settle the balance. Of course, there’s much more to think about when it comes to moving to the US. Download our full guide below for some further advice on pensions, the economy, healthcare and more. We hope it helps you say ‘howdy’ to the US soon.